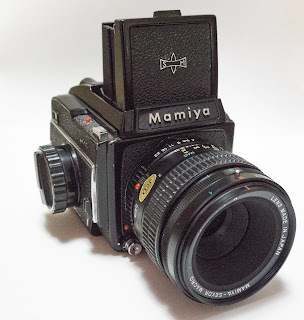 The next camera up to shoot is my medium format, Mamiya M645 with an 80mm Macro lens. I've had this camera for about 5 years, but haven't used it much. Mainly because ... well ... not sure why. Probably because getting 120 film developed is a bit of a bother unless I soup it myself. That's a shame because this camera is a work of art. It reminds me of a piece of American Iron / Muscle Car feel. Heavy and powerful. I took the Mamiya out this evening with a 120 roll of Ilford HP4 Plus B&W. The film is rated at ASA 400. This camera is all manual with no light meter. For this shoot I used the "sunny 16" rule and set my camera at 1/500 second and f/11-f/16 when it was sunny (bright) and then adjusted as necessary. Basically, I eye-balled the exposure. I used my waist level viewfinder for this shoot with the magnifying eyepiece throughout the shoot. It takes a bit of getting used to because everything is reversed in the viewfinder. It takes some practice to get used to focusing. But then when you push the shutter release button, hmmmm, butter. The slap is like music. That roll went fast. Just snapshots around town. I'll report back when I get the film back from developing.